A landlord who doesn’t keep up-to-date with the complex and often fluid legislative framework around residential tenancy or who doesn’t have a sufficient understanding of their rights and of those of their tenants may find themselves in breach of the law. The laws cover a wide range of things such as tenancy databases, bonds, rent increases, security, repairs and time frames for urgent and non-urgent maintenance, frequency of routine inspections and the service of notices (e.g. tribunal or eviction notices) and negotiating the legislation can be time-consuming and frustrating. Breaches (by either party) can be costly, plus tenants often seek compensation or flout the laws because they know that the landlords aren’t legal experts and that they are likely to get away with it. Choosing the wrong tenant can lead to costly problems down the track. Most private landlords don’t have the expertise, experience or the tools to screen applicants thoroughly and have to rely on limited information (such as pay slips and CVs) and their intuition. They aren’t generally privy to crucial selection criteria such as rental history (which a Property Manager can access using industry databases) and they often don’t have the time and the processes to do the requisite background checks. Many private landlords put themselves in risky situations by not having sufficient documentation to support the tenancy with some going as far as simply relying on a handshake as confirmation of the arrangements. Remarkably, despite the fact that an investment property is such a major financial undertaking, many landlords don’t even have a legally enforceable contract to protect their investment or they use an incorrect lease document which isn’t relevant for their state or territory. Many private landlords also don’t prepare a thorough condition report for the property or a full inventory and don’t set up other important documents such as sign-out sheets for keys and requests for repairs. A bond is a security deposit which the landlord holds in case the tenant defaults on their obligations, causes damage to the property etc. Many private landlords fail to do this and have no recourse at the end of the tenancy when things have gone wrong. Procedures for property inspections are set out by law for each state and territory and failure to implement these can lead to legal action and costly penalties. 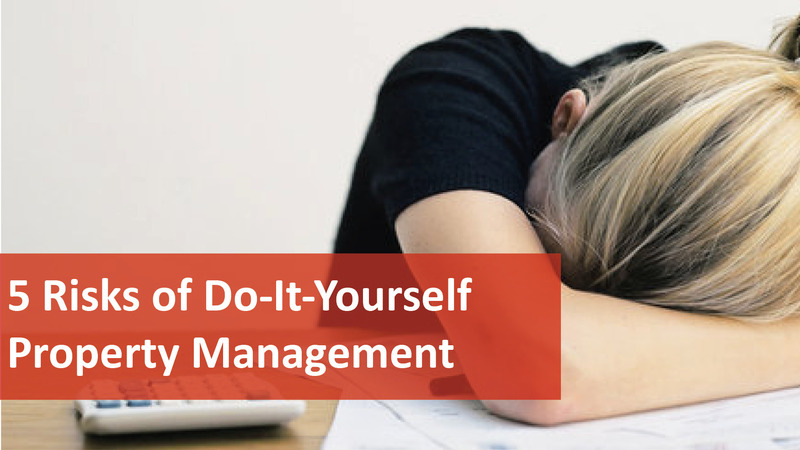 Many DIY Property Managers don’t adhere to a schedule of regular inspections because they don’t have the time to organise these with tenants, or they want to avoid confrontation or they want to avoid any maintenance costs. There are many excuses for not conducting regular inspections, but the risks are huge. Another area where many DIY Property Managers fall short include inappropriate handling of rogue tenants because of inexperience or a lack of knowledge and not responding immediately to rent arrears. This can lead to big problems and costly disputes down the line which is why many industry experts actually urge landlords to engage the services of a professional property management company in order to reduce their risks. But don’t just believe us! Managemyproperty.com discuss the multitude of benefits in securing a good property manager as opposed to self-managing in this article. To save yourself the headache contact We Love Rentals® to experience property management with passion.